The Advanced Management Program (AMP) is an immersive, transformative five-week program that guides senior leaders in honing their leadership capabilities. AMP is exclusive and selective: only about 55 executives are accepted per session. The result is an optimal learning environment, with a diverse participant cohort for better peer learning, and a global, lifelong network of trusted peers. AMP, delivered in partnership with Wharton’s Anne and John McNulty Leadership Program, is led by Wharton faculty who bring extensive business knowledge, research, and expertise to bear on all aspects of the program. This management development program is a defining personal and professional moment — the starting point for that next level of achievement and success. Wharton’s AMP is a transformative learning experience, says Academic Director Michael Useem. AMP offers comprehensive content and an experiential approach that creates an invaluable, reflective pause from routine. Leveraging the strengths of Wharton faculty, the curriculum has a rigor and an emphasis on senior leadership not found in other programs. In addition to leading classroom sessions that provide cutting-edge knowledge and tools for management, marketing, finance, strategy, and organizational dynamics, core faculty members are present throughout the program and lead daily integration sessions. This tremendous access means you will leave with strong professional relationships, and not just email addresses. Skills introduced in the classroom are put to the test through multiple learning opportunities that demand critical thinking, decision-making, and high-performance teamwork. These may include a rowing experience, film-making, and a dynamic group project. Expanded network of meaningful relationships built within a highly accomplished group of executives. AMP participants also become Wharton alumni, part of a global alumni network with more than 98,000 members. Nominator Information: If we have questions about your application, the AMP Admissions Committee may require that the AMP Candidate Nomination Form be completed in advance of our decision. This form would be completed by your CEO, Division President, or other nominator and will provide us with additional information about your professional development objectives. *If you have less than one year of experience working in an English-speaking environment, or if you are unsure about your current level of English, please contact us immediately at execed@wharton.upenn.edu. We will schedule an appointment for you to speak with one of our language specialists about our business English language programs. The Admissions Committee may also require an interview by phone. How will I manage a five-week hiatus from my job? Research and experience indicate that five intense weeks (Monday through Saturday) provide the right level of rigor and immersion for a senior management audience. While this is a significant time commitment, successful leaders are able to convert this time away into an opportunity that extends beyond the AMP experience itself. They delegate their daily and monthly tasks to others in their organization, preparing them for greater responsibility. When participants return to the office, they often choose to maintain the new delegation of duties to gain more time to implement the new practices and ideas gained at AMP. 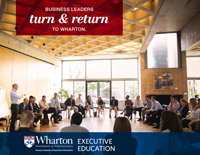 How is Wharton AMP different from executive education programs at other business schools? Wharton AMP is grounded in key components of peer mentoring, real time context, and guided practice and reflection. While case studies come into play, learning is largely experiential and interactive. 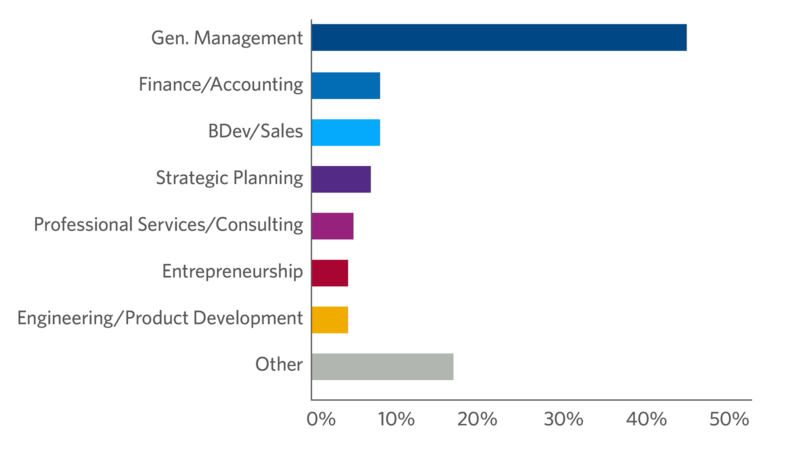 Wharton AMP is exclusive and selective, with a maximum of about 55 participants. This size class is large enough to foster diversity of vertical industries, disciplines, and cultures, but small enough to build strong relationships will all classmates. Other schools often have in excess of 100 participants per program session. Wharton AMP includes case studies as part of the curriculum, but they’re not the main focus. Wharton faculty members bring real-time, up-to-date information and trends into the sessions in order to spark discussions about future goals and the possibilities of tomorrow. Other programs rely primarily on historical case studies to educate and illustrate business practices. How much does AMP cost? What forms of payment are accepted? The total AMP fee is $58,500. This includes private accommodations, most meals, and all program materials. If you are accepted into AMP, we will issue your company an invoice. A $15,000 deposit is required to reserve your place. Payment in full — by check, wire transfer, or credit card — must be received at least 60 days before the program start date. A full refund will be issued if cancellation in writing is received 90 days prior to the start of the program. Otherwise, the $15,000 cancellation fee will apply. Two program sessions are offered per year, in the summer and fall, in Philadelphia. Participants live in residence and attend classes in the Steinberg Conference Center. It is surrounded by the culture, history, and vitality of the birthplace of the United States. The City of Philadelphia is renowned for its wealth of restaurants, theatre, sports venues, and entertainment. Can my spouse or family attend? During the last two days of each program, spouses, partners, or other guests are welcome to take part in the Partners’ Program, which features selected AMP sessions and social activities. After more than four weeks of absence, participants welcome this shared experience and find it greatly enhances and eases their return to their home and work environments. Upon completion of AMP, you will be granted Wharton alumni status. You will be joining one of the largest business school alumni organizations in the world. 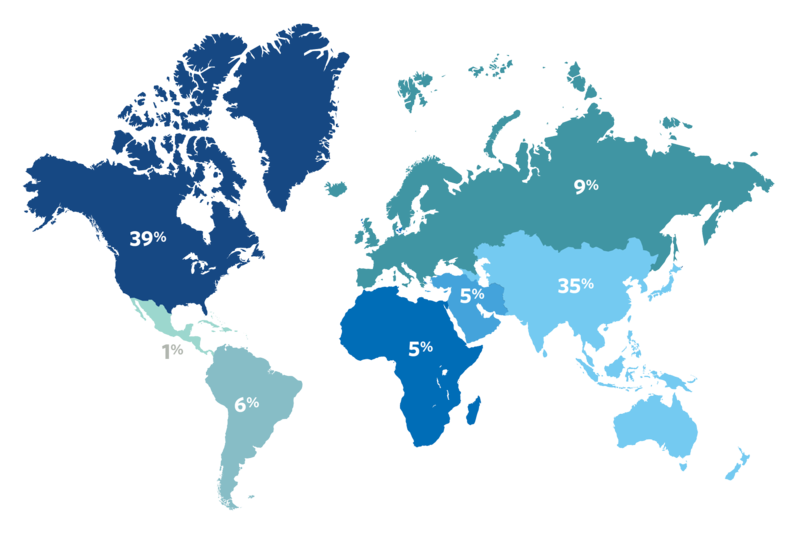 With more than 98,000 members who live and work in more than 130 nations, the Wharton alumni network helps you stay informed through annual forums around the world. Upon graduation, AMP graduates will receive a lifelong Wharton email address, as well as access to alumni communications. I graduated from university several years ago. Do I need to brush up on my finance or business algorithms to attend? AMP participants come from different professional and educational backgrounds, so the program starts with a quick immersion into key business components. This helps to build a common language before rapidly advancing to a higher, more sophisticated level. The entire five weeks have been carefully crafted to address the overarching knowledge and leadership needs of top executives, not undergraduate business majors or recent MBA graduates. We are preparing these senior leaders for their next challenge within their organizations or beyond, and that means becoming “ambidextrous” in business — seeing all perspectives and being equipped with a new global network and framework to draw upon. Is there an application deadline for AMP? Admissions are done on a rolling basis, so the earlier you submit your application the better. It is best to apply at least three to six months in advance of the program date you wish to attend. This should ensure adequate timing for you to delegate your monthly tasks and provide an opportunity to guide and coach your colleagues before your departure. With sufficient time and planning, you will feel confident that everything will be in good hands during your absence. I've been accepted to AMP, but I'm unable to attend. What should I do? We are more than happy to reschedule your attendance for the next program date, or we can work with you to identify a more convenient session. Cancellation: Cancellations received more than 90 days prior to the program’s start date are entitled to a full refund. Cancellations received less than 90 days to the program’s start date will incur a charge of $15,000 (USD). Transfer: Wharton will consider requests to transfer to another program which has a start date within one year of the date of the program. Requests to transfer received 90 days prior to the program’s start date will not be charged; transfer requests received less than 90 days will incur a $5,000 (USD) administration fee. Registrants are permitted a maximum of two transfers before forfeiting the entire tuition. English isn't my native language and I don't work in an English-language environment. Can I still attend AMP? All AMP candidates must be fluent in English to complete reading assignments and to actively engage in group discussions and activities. AMP is an intense program, and being able to fully communicate in English with your executive peers and Wharton faculty is an integral part of the experience. We have many Executive Education programs that enable business leaders to harness and exploit the speed of change that’s happening across their industries, markets, economies, and other related aspects, at home and abroad. All are based on real-time business dynamics, economic challenges and opportunities, global trends, and market shifts. Additions and refinements to the curriculum are constantly considered. We fully expect half of the programs we will offer in five years to be ones that have yet to be developed. To see our current list of programs, please visit the Senior Leadership section on our Leadership Programs page. How can I stay up to date on Wharton Executive Education events and programs? 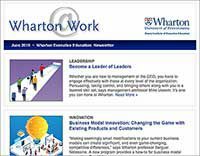 Subscribe to our free monthly digital newsletter Wharton@Work. Just fill out the subscription form or check out the current issue. AMP 56 was one of the most profound experiences of my life. The experience was analogous with peeling away the layers of an onion. This forced deep introspection (something that I hadn't done for a very long time) which created an unbelievable level of renewed self-awareness. For me the programme design helped surface the ‘real me.’ Whilst these onion layers were being peeled away I realized how outdated many of the tools that I used in business had become. Some needed replacing and others needed sharpening. Most importantly, in this exposed state, we developed meaningful friendships and an extended community that nurtured each of us, helping us rebuild ourselves. I left a far more complete and better human being than when I arrived." Kent MoyerCEO/President, The World Protection Group, Inc.